Getting up from the bed, walking to the restroom in low-light conditions, and similar events all contribute to why the night is a dangerous time for individuals with mental and/or physical limitations. 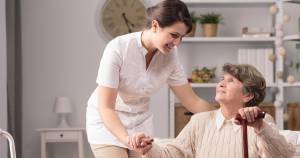 At Assisting Hands Home Care, we offer overnight care services in order to make evenings more manageable and safer for seniors and adults with disabilities. Our caregivers stay awake throughout the night to assist as necessary. In the event of an emergency, we can respond at a moment’s notice. Limited lighting, disorientation, and fatigue are the primary factors that contribute to accidents at night, while certain individuals may have medical conditions that warrant continual care. If you or a loved one fits into any of these categories, we highly recommend you take advantage of our overnight care services. Many family members attempt to care for loved ones as needed, but this can result in a number of problems. Statistics show that roughly 25% of informal caregivers report poor health themselves. This is because of stress, lack of sleep, and the fact that these duties are often added on top of a career and other responsibilities. Additionally, the individuals receiving the care will be at a greater risk because of the natural fatigue of the informal caregiver. By utilizing our professional services, your loved one will receive more attentive care, and informal caregivers will receive the peace of mind they deserve. Our overnight care services are designed to provide those receiving the care with optimal caregiving services through the night, and their family members with greater peace of mind. As we mentioned above, these services are completely customizable. To learn more, or to schedule an appointment, simply contact our Assisting Hands Home Care representatives at (847) 915-6186. We are happy to address your questions or concerns, and are proud to assist those in need.